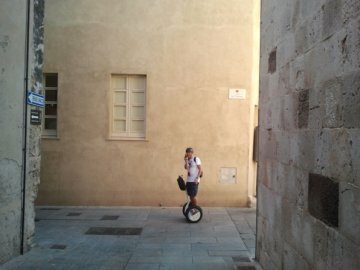 This guided tour takes you on a Segway through the city of Cagliari. Rolling through the narrow alleys of the old town you'll pass historic monuments and buildings. 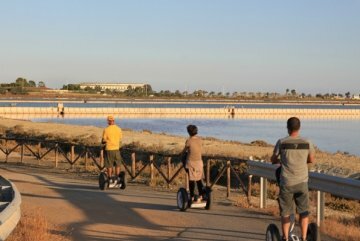 Every Segway is equipped with an audio system informing you about the sights along the way. The tours includes several short photo-stops, so don't forget to bring your camera. 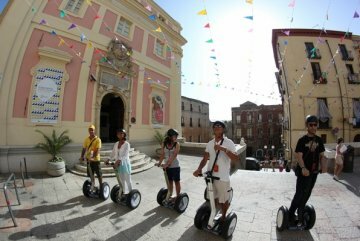 This excursion is a fun and unique way to discover the historic centre of Cagliari! 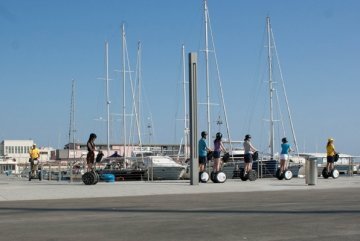 The standard guided Segway tour takes about 1,5 hours and offers a special way to discover the city. The Segway Tour Deluxe takes about 2,5 hours. This tour shows you even more of the city, including various magnificent panoramic views. Unlike the standard tour the Deluxe tour includes an aperitif in the historic Castello district. • Departure: daily at 10:00 a.m. or 3:30 p.m.
• Minimum weight: 45 kg. – maximum weight: 115 kg. 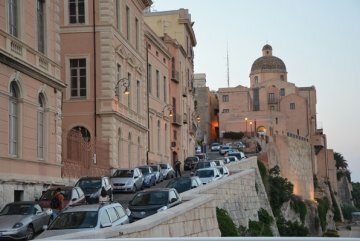 "Nice Tour with Guide through Cagliari"
Rates are per adult per tour and include a short briefing, an audio guide, helmet and guide. The Segway tour Deluxe also includes an aperitif.